The Latest Star Wars news, Photographs and MCU Rankings Continued! This week we get excited about the new Star Wars news, the Playstation Retro getting a new price, and a Sekiro easy mode? Zach gives us his impressions on a game called Photographs and we rank the next set of MCU films. How does your list compare? This week we begin battling it out to create TPL's ranking of the MCU movies. Robby has a love, hate relationship with Sekiro. Shannon Talks Elder Scrolls Blades and Zach drops some news about Sony revoking digital codes from retailers, Anthem's continuing woes and Borderlands 3! This Episode we give early impressions on Apple Arcade and what we want out of the new Nintendo Switch consoles. Robby talks Sekiro and why this is the hardest From Software game EVER! We also discuss Shazam and the horror movie Us. If you enjoy the show please leave us a review wherever you download us! Have a great week! This episode the gang talks Google Stadia, Disney possibly reopening Lucas Arts and how great The Division 2 is. The guys get hangry about breakfast cereals. And finally we break down our list for the best movies in the Fast and Furious franchise. Enjoy the show! Do you live life a quarter mile at a time? Are you Too Fast Too Furious? We have some bonus content heading your way next week. For now enjoy the latest episode! 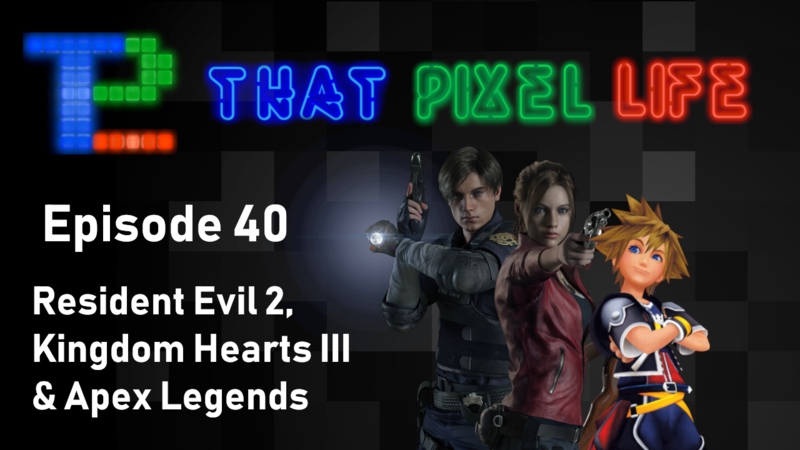 This week the gang talks about Captain Marvel, Final Fantasy IX and Tetris 99! Episode 42! Pokemon Sword and Shield, Bay Area video game roots, Anthem and some shark game!? In this episode, Zach officially takes the helm as host of the show and leads the team in a different direction. In our Industry Buzz section, the trio talks about Reggie Fils-Aime leaving Nintendo and what that means to both the company and the fanbase. The Weekly Console-tation segment focuses on Crackdown 3, Anthem, Tetris 99 and other new releases. 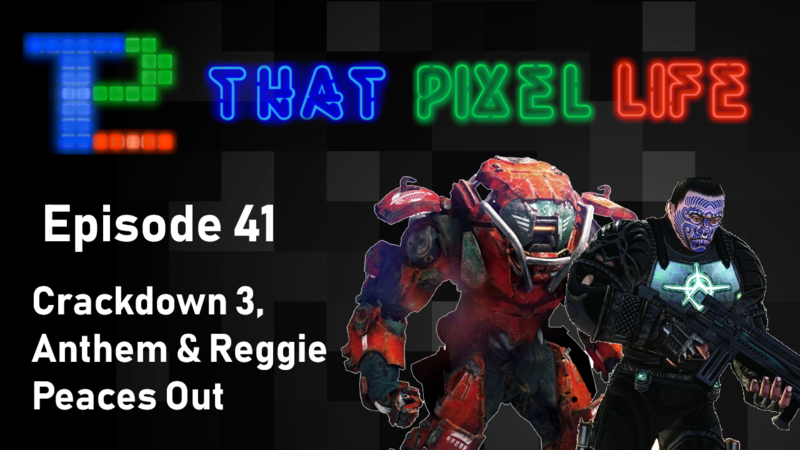 This week on That Pixel Life, the gang covers the launch of Apex Legends by talking about the surprise launch of the game, the currently quality of the gameplay and the overall success it has found in a 24-hour timespan. Will Apex Legends succeed or fizzle out? We give our opinions on Respawn’s battle royale Titanfall spin-off. Also this week, we review Resident Evil 2. Guess which one of us is already claiming Game of the Year on this one? Also, Josh gives Kingdom Hearts III an honest shot, so find out if the latest game in the series was able to convert him into a fan. Zach gives his opinions on Celeste and Shannon lets us a bit about WarGroove as well. Finally, we wrap it all up talking about some films such as The Girl in the Spider’s Web, Ralph Breaks the Internet, Star Wars: The Last Jedi and more. Due to scheduling conflicts this week, we unfortunately had to postpone the release of Episode 40 to next week. We’re not a fan of doing this unless we absolutely have to, so to make it up to the community, Josh and Zach got together to have a little one on one discussion about a few topics we were planning on including in episode 40. This week the duo discuss their impressions with Anthem and their thoughts going into the launch. 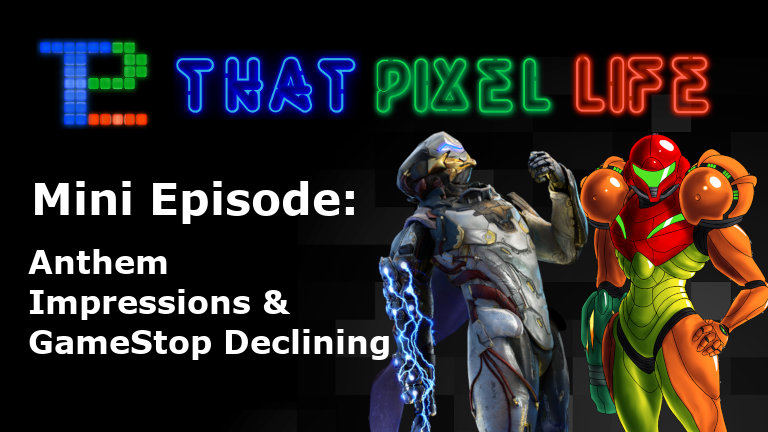 Also, we discuss the recent decline of GameStop, Nintendo swapping dev teams for Metroid Prime 4 and Metro Exodus making a move to the Epic Games Store on PC. Hopefully this mini episode will tide you all over until the REAL episode 40 drops next week. Thanks again for the patience and enjoy the show! It’s a slow week as we’re all patiently waiting for Resident Evil 2 to drop, so the gang answers a question from a community member concerning GameStop and what will happen if the retailer dies alongside physical video games. We sit and discuss how long physical games can hold on before they’re extinct. Our Industry Buzz section includes our thoughts on the Mortal Kombat 11 reveal event from last week along with the announcement of a Power Rangers fighting game with cross-platform support. We also question what’s going on at IGN with all of these botched reviews lately. In our Weekly Console-tation segment, Josh attempts to give the original Kingdom Hearts another shot and questions why a Spartan soldier must go on a quest to make Roman viagra. Robby explains how Epic Games continues to kill it with Fortnite. Afterwards, we wrap it up by discussing the Oscar nominees for 2019, Zach’s thoughts on Into the Spiderverse and Josh reviews Netflix’s The Punisher Season 2. Thanks you all for listening, Have a fantastic week and enjoy the show! 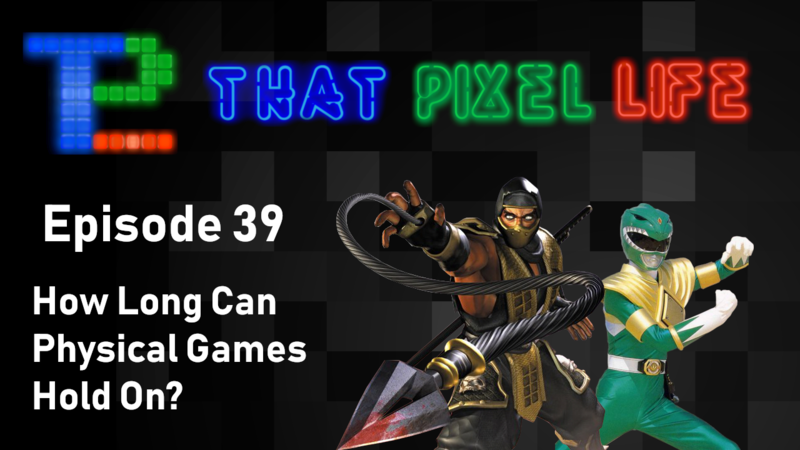 That Pixel Life is a new gaming podcast by veteran podcasters that focuses on the industry and its culture. Copyright That Pixel Life 2018 All rights reserved.